The Loyalist Games team produced their first official board game: a Pepper&Carrot game named "The Potion Contest". They launched a Kickstarter campaign yesterday. Johnathan Pritchard, the leader of the project, worked with game designer Guillermo H. Nuñez, graphic designer Julieta García, and artist Antti Hakosaari to build this game (reusing the free/libre sources and universe of Pepper&Carrot). In the game, you'll discover new witches, new artworks, and items especially designed for the board game. I wasn't involved in the production process, and I am not collecting any revenues from the Kickstarter campaign (my source of income is the patronage of my readers). But I'm really happy with the work of Loyalist Games! The Kickstarter page includes a very good disclaimer and all media (page, videos, etc) are perfectly compliant with the CC-By license attribution. Also, icing on the cake: the team is releasing the full board game, artworks and rules under the Creative Commons Attributions. 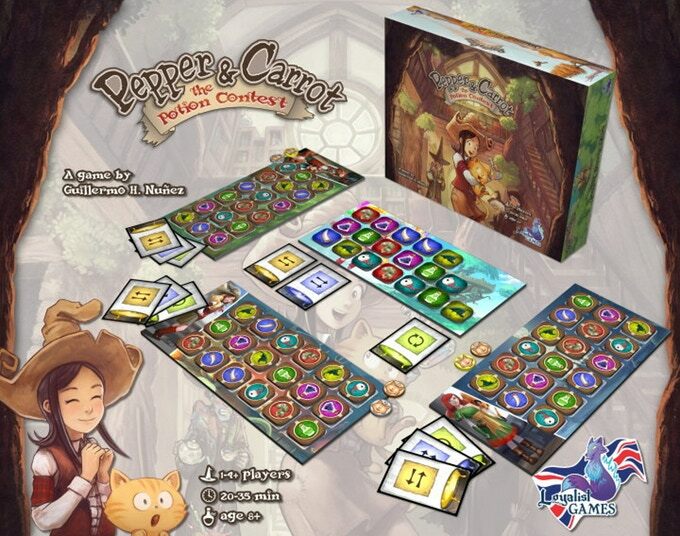 So, if you are interested in getting a box of the game "Pepper&Carrot: The Potion Contest" or supporting the work of Loyalist Games, go and check out their Kickstarter page; Loyalist Games also made plushes of Carrot as bonus for the campaign, video reviews, a profile on BoardGameGeek... and more! Thanks Craig, really glad to be apart of this amazing world. Looking forward to making some fun stuff/expansions downstream.